Why Is Storage So Hot? Cisco Provides a Clue. In March of 2009, Cisco (s csco) launched its Unified Computing System, or UCS for short. It signaled to other data center equipment vendors that the separation between servers, networking, and storage was finished. With that single move, the industry set forth on a course to consolidate to integrated solutions, a trend we are in the middle of today. Major vendors, sensing the integration trend, set off on an acquisition spree that sparked several multi-bullion dollar storage deals. This may be because the server roadmap is well understood, and highly commoditized. We are likely to get more cores, and more virtual machines in servers for a long time to come. With storage, it’s not as clear. The impact of virtualization on storage is only beginning to rear its head. Deployments of large-scale, big-data solutions are still formative, and cloud storage options abound. Until they lock their blueprints firmly into place, the acquisition hunting might well continue. Remember that storage is the gift that keeps on giving. The data never stops. Cisco enters the server market essentially declaring war with server giants HP (s hpq), IBM (s ibm), and Dell (s dell). After IBM’s initial dialog with Sun, Oracle (s orcl) enters the hardware market. 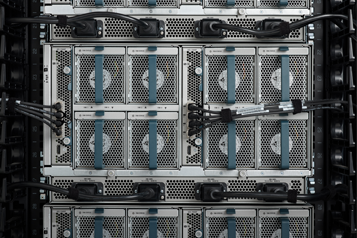 To counter Cisco’s server entry, HP names a storage heavyweight from EMC to cover server, networking, and storage products, a clear signal they have their own plan for converged infrastructure. However, Donatelli is barred from managing the storage business for one year following a lawsuit from EMC, forcing HP to major storage moves on hold, except for a small acquisition of scale-out file system vendor IBRIX in August 2009. The two dominant storage companies, NetApp (s ntap) and EMC, sense that the ground is starting to shake. They decide to defensively maintain positions in the storage segment. At the time, I applauded NetApp’s bid because it appeared they were ready to expand software offerings beyond a one-flavor-fits all approach of their core operating system ONTAP. EMC wins control of the de-duplication market leader to bolster and defend its dominant storage position. This takes the wind out of NetApp’s sails and ensures that EMC has a tighter lock on hot storage technologies such as de-duplication which DataDomain first developed and popularized. While Donatelli is waiting out the storage hiatus, he can keep busy adding to the networking portfolio. HP already had the Procurve line of equipment but more will be required to compete with Cisco. The game is on. Oracle now has comprehensive server and storage product lines plus all of Sun’s software portfolio. 3Par (s par) built a storage system capable of competing with EMC’s Symmetrix business. This is no small feat, which I described as The Simple Reason Dell Bought 3Par. At the time, neither HP nor Dell had a high-end product under their own brand to compete with EMC or NetApp. Dave Donatelli at HP is free of his storage exile. A bidding ware is about to break out. Oracle mentions it needs expertise from executives who know how to manage a $100 billion dollar business, no doubt a shot across the bow to HP and IBM. There are also rumors that Oracle might buy EMC, which could net the company a significant storage revenue stream and lock up the high end of the storage market. At the time, I was convinced HP needed to win this deal because they have an enterprise sales force capable of selling high-end storage products (rebranded from Hitachi Data Systems), and revenue growth could come sooner than Dell, which lacks the same organizational reach and depth in the high-end storage market. Netezza emerged as a strong company in data warehousing, a core element of the data mining renaissance. IBM, which through acquisitions such as Cognos in business intelligence and SPSS in statistical software, knows how to monetize analytics for big business. Similar to 3Par, Isilon (s isln) took a long but ultimately successful road in building a product that competes head on with certain portions of EMC rival NetApp’s file storage business. Isilon specializes in scale-out storage, where companies like HP, NetApp, and EMC have made multiple bets. Did Cisco have any idea what kind of fallout it would trigger with its move? My guess is it went through plenty of scenarios ahead of time. It has the cash and capability to play the M&A game with HP, IBM, and Oracle should it need to. So we may not have seen the end just yet.